I know,, I know... every year I post the same picture on Father's Day. I'm sorry, I can't help it. It's just a great illustration of how sweet my dad is. For those of you new to the blog, this is my Dad, Dave. As you can clearly see in this picture , he's awesome. Happy Father's Day, Dad. I love you tons. And Happy Father's Day to all the fabulous Dads out there in the world. Which little kitten is that? This is one of my fav pics! I remember how little Willamena just couldn't get enough of your Pop! So cute (both of 'em)! Happy Dad's Day to all Dads. That includes Dad's with four-legged kids too. I <3 this pic, and I never get tired of seeing it! Happy Father's Day to all you Pops out there. Laurie, as far as I'm concerned, you can post this picture every single Father's Day. It's the *perfect* illustration for today, showing your love for your dad, and his tender ways with the itty bitties. Awesome indeed. Well, this is my first father's day here and I've never seen that photo before. Thanks for posting it again. It's too good to be missed. It looks like Willamena is fascinated with your Dad's mustache. Did she ever paw it? Happy Father's Day to Laurie's Dad! It's a good picture. The one with Craig covered in kittens waiting in line for cuddles is good too. Charlene, Craig is your real father. He's not your biological father, but he raised you, loved you, and protected you. You could always count on him to be there when you need him. That's what a real father does. Laurie, do you have any follow-up pics from Willamena (my fave; Tressa is second)? This is one of the best photos ever. I'm so glad you post it every year! I've looked on Flickr for the IBKC alumni. Is there a link on the side with it and am I just blind that I can't find it? Just love the look she is giving him... Like "how on EARTH do you make that noise?" the look on that kitten's face is priceless. i'd also like to acknowledge the new layout.. i like it! The pic says it all. Hope yoor dad had a great father's day! I can see where Laurie gets her gift of kitten-whispering from! Great pic, great tinee tabbee, and great Dad! 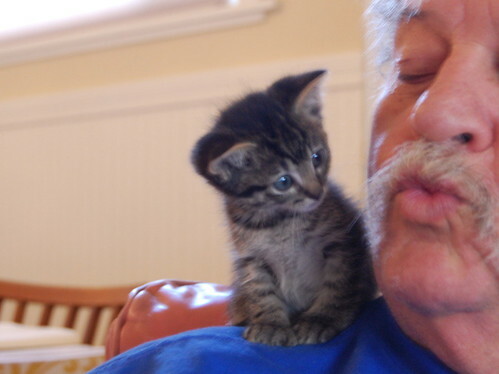 That is an adorable photo and it shows how much your Dad loves the kittens and vice versa. I don't think I would ever get tired of seeing this photo. Willamena is so tiny and so sweet looking. Do you have any updates on this lovely little lady kitteh? Such fascination, just waiting to pounce!